If you have a whimsical sense of humor, these Giant Microbes might make a hilarious Christmas gift or decorations for your dark or horror themed Christmas tree. 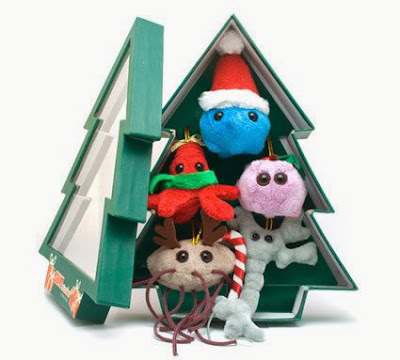 This Christmas-tree shaped box of Giant microbes Christmas ornaments includes Common Cold, Brain Cell, Kissing Disease, and E. coli. 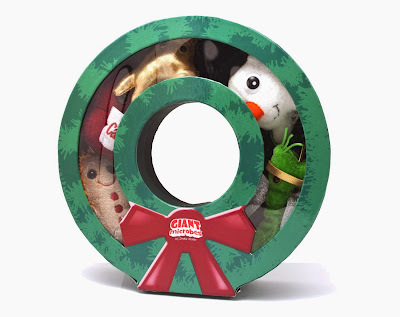 This Giant Microbes wreath box is perfect for gifting. The plush microbes inside include Stomach Ache, Nerve Cell, Sore Throat, White Blood Cell, and Amoeba. This set of Giant Microbes Christmas ornaments comes packaged in a festive stocking-shaped box. 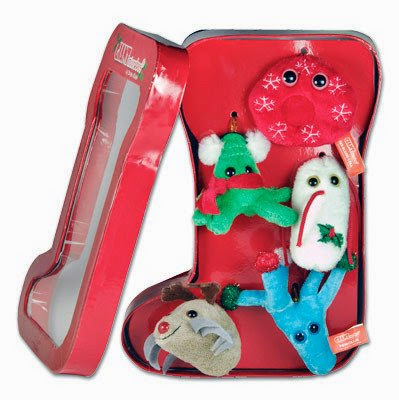 The set includes Penicillin with red, green and white caps; a limited edition Green Amoeba with scarf and ear muffs; a Dust Mite with reindeer antlers; Salmonella with holly embroidery; and a Red Blood Cell with snowflake embroidery.